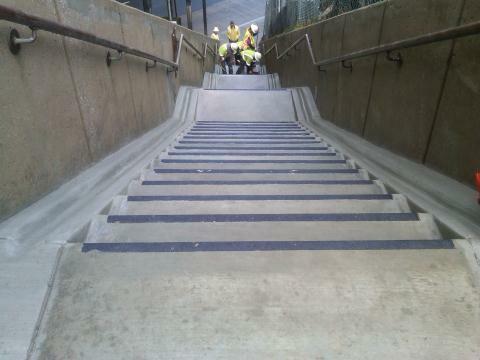 Metro completed work retro-fitting a staircase at the Rhode Island Ave-Brentwood station last week, and the new stairs include channels to make it easier to bring a bicycle up to, or down from, the station. Metro’s Parking Office included this work as part of the transit-oriented development that is nearing completion at the station, as well as Metro’s Pedestrian and Bicycle Element of 2012-2017 Capital Improvement Program. 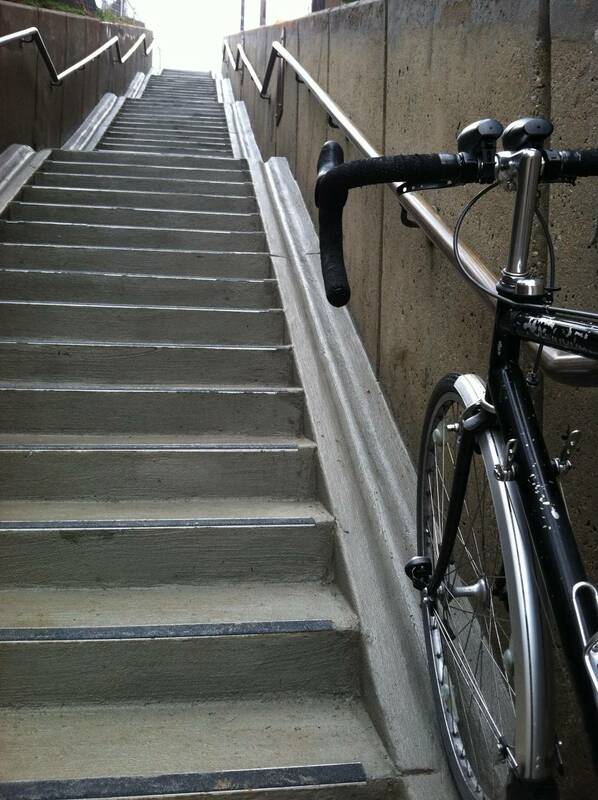 The staircase reopens a pedestrian connection from the station to the south side of Rhode Island Avenue, and makes it easier for customers to bring a bicycle as well. The stairs had closed late last fall for a retrofit. Pedestrians can once again connect from the bus loop area to the surrounding neighborhood. 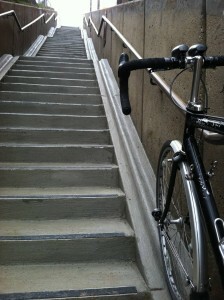 To bring your bike on the stairs, put both wheels into the channel along the side, tilt the bike inwards a little, and push/hold your bike so it rolls alongside as you walk. The stairchannel, sometimes called a runnel, is a new kind of facility for Metro that we hope can help accommodate bikes in difficult areas with steep grade changes. 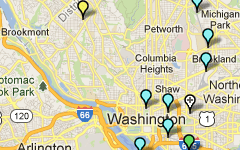 We welcome your feedback to help guide potential future installations! Have you seen or tried the stairs? What do you think of them? Pledge to Go “Car Free” on September 22! Thanks for installing the stairchannel. I hope to see bicycles continue to be accommodated in this way for the future. I read about these on the Copenhagen Cycle Chic blog a while back and assumed it would be years if not decades before we saw them here. Kudos to Metro for starting to implement such a simple and elegant solution!!! Notice for Super NoVa Transit/Transportation Demand Management (TDM) Vision Plan Public Meetings What Does the State of the Commute Survey Tell Us?